in a small storefront in the Ironbound section of Newark. Elvira had become interested in funeral service after the death of her husband. A widow at age 29, Elvira began assisting a local funeral director, who encouraged her to finish school and go to mortuary school. An extraordinary woman, particularly for that time, she worked all day for the funeral director and spent nights in a variety store to support her children. Elvira served her apprenticeship and was licensed in 1934.
Business was slow at first but Elvira persevered, volunteering in local churches, community and civic associations, slowly people accepted her. By 1940 Elvira’s business had grown so much that she was able to purchase a beautiful art deco building, formerly a savings and loan at the corner of Pacific and Walnut Streets in Newark’s Ironbound section. Later her three sons Frank, Richard and Joseph joined the business and the Galantes opened their second funeral home on Sandford Avenue in Newark’s Vailsburg section. In 1965 an 8,000 square foot funeral home was opened at 2800 Morris Avenue in Union and again in 1975 a location was opened at 54 Roseland Avenue in Caldwell. 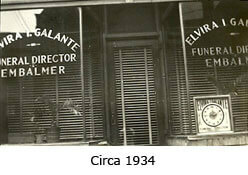 In 1999 the Galantes purchased the Santiago Funeral Home in Newark’s Ironbound section and created a dual operation. In the 1970s Elvira’s grandchildren Frank, Victor, Steven, Richard, Jr. and Brenda all were licensed and joined the business making them the third generation of an all family tradition of service. In 2008, Victor II and Frank R. Jr. joined their family as the fourth generation of Galantes committed to continuing our tradition of excellence and caring service. Today the Galantes continue to appreciate the trust given to them by families in their time of need. They continue to serve families in the fine tradition of service, attention to detail and caring that has been the hallmark of our history.